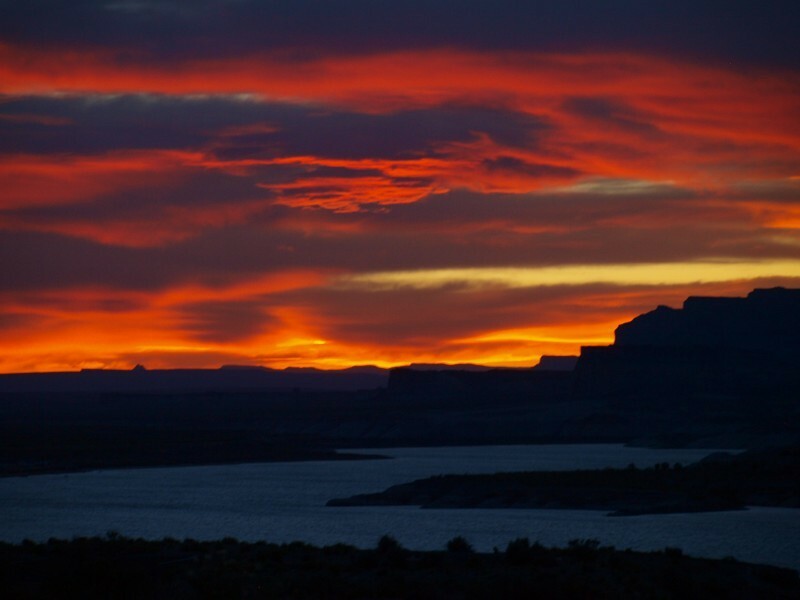 If you look around at the canyons, the hotels, the restaurants, and the lake, it is easy to see that the tourist season here in Page and in the Lake Powell communities has reached peak season activity. Tour buses continue to come in and out of town, bringing people to see the canyons, the lake and the dam. We also see many boats being towed into town to enjoy a few days or even weeks on the lake. This is also a great time to enjoy the beauty, not only of Lake Powell and the surrounding rocks and canyons, but to watch the sky glow at sunrise and sunset as clouds from the monsoon weather to our south pass through on a daily basis. Every sunset reminds us of the creative hand of God, painting a beautiful picture to end one day, then another totally different picture to begin the next day. This time of year is a photographer's delight. Many people settle in at a local hotel or campground and spend some time visiting the many amazing places that can be seen just a short drive from Page. Some of those who stay over the weekend come to visit our church and to worship with us. We see visitors from all over the world, as well as from all over the United States in our services during the summer. It helps us who live in this isolated part of the country to remember that the church is much bigger than just our local congregation. What a joy it is to meet Christians from other parts of the country and the world who love the Lord and His people just as much as we do. It reminds us that we are a part of a large, amazing family. If you are here visiting, or if you live here in Page but have never visited our church, I would invite you to stop in and worship the Lord with us. Our morning service is at 10:00am on Sundays. You never know what God may have in store for you as you worship with our church family.